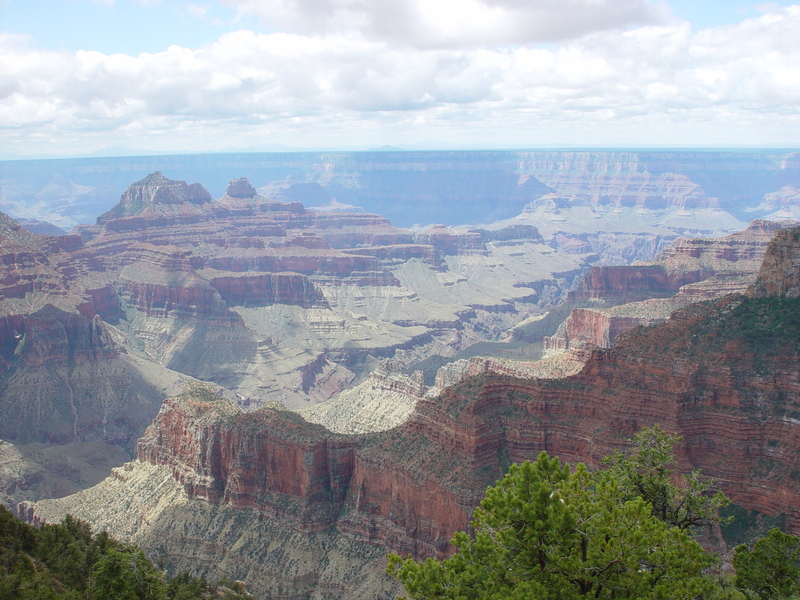 My family and I just returned from our latest trip to the canyon country of the southwest U.S., and this time we visited the North Rim of the Grand Canyon, which the kids had not been to yet. It’s almost futile to post pictures of the Grand Canyon, as no image can possibly capture the immensity or the play of light. And I really don’t want to get in the habit of filling posts with my (or rather, my husband’s) vacation photos. But I’m going to do it, this one time! 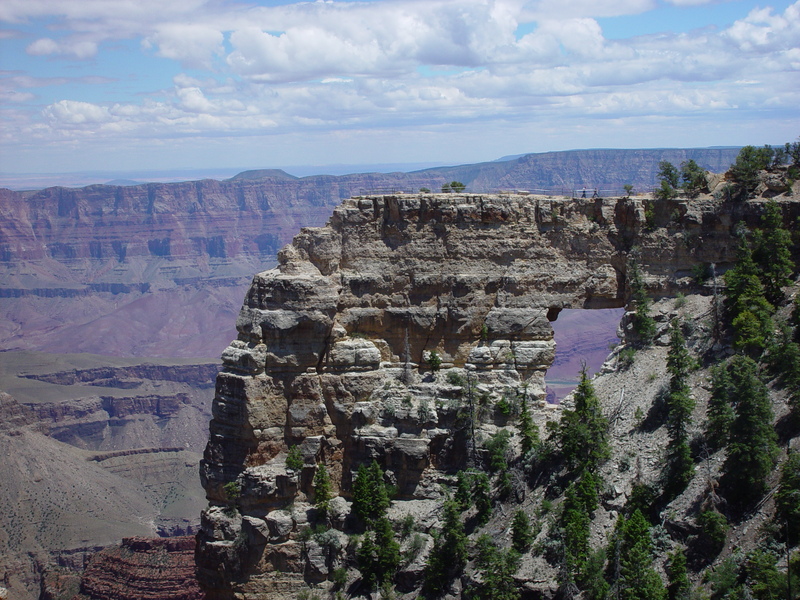 The hole in this rockface is called Angel's Window. For a sense of perspective, click to enlarge and spot the two people walking out to the viewpoint above it. I love the quote above from Barbara Kingsolver because it captures so eloquently the key thing I always rediscover when I spend time out in nature – humility. That we are each really so tiny. Not in a we-don’t-matter kind of way, but in a the-universe-is-grander-than-we-can-conceive kind of way. And it doesn’t take a visit to the Grand Canyon for that. Just watching the bees and birds out in my little LA yard, going about their business with not a thought to me or human endeavors, can restore that sense of perspective. But the Grand Canyon is unique. In my post on planet earth’s chakras, I listed it as my choice for the earth’s root, or 1st, chakra. I really didn’t mean for that post to be taken absolutely literally, but I do think it’s interesting to observe the different kinds of energies that emanate from places on the earth, and the chakras are a good archetype to use for analyzing this. In some cases, the unique energy of a place is reflected in what we – that is, humanity – build in and around it, and how it impacts us. I’ve lived all over the United States – first as an Air Force brat growing up, and then as a traveling consultant and general nomad as an adult. To me, each section of the U.S. so clearly emanates a different energy, and from the foreign travel I have done, it is clear this is the case everywhere. Los Angeles, for example, (where I currently live), has a dreamy, almost astral quality to it, that corresponds exactly in my mind to it’s global role as a factory of illusion, in the form of the trillions of dollars worth of television, music and films that are broadcast and exported from here around the world. When I first moved here from New York City, it was quite a shock to my system – I had a hard time staying grounded. New York is solid – Manhattan is literally an island of rock – and sharp, and dense. The Pacific and Atlantic oceans are different from each other in a similar way. The Grand Canyon is raw, and primal, and pure power. In earthly terms it is ancient beyond our human comprehension. The layers are laid bare for us to view, making it one of the most fascinating places on the planet for archaeologists, geologists, and paleontologists. Each line of rock, each change of color, represents millions of years, with some rock layers estimated to be 2 billion years old. The history of the world is written there. All of this ties in well with the themes normally associated with our own root chakras, in our bodies. It’s our raw connection to the earth, our body, our physical survival. It’s often associated with the ‘flight or fight’ response, and with the raw open potential of our kundalini, or life force, which we may or may not choose to fully harness. It’s also associated with our own familial roots – our ancestry, our culture, our blood family. This particular trip I also witnessed the incredible devastation that a huge fire two years ago had wrought in the forests at the top of the canyon. 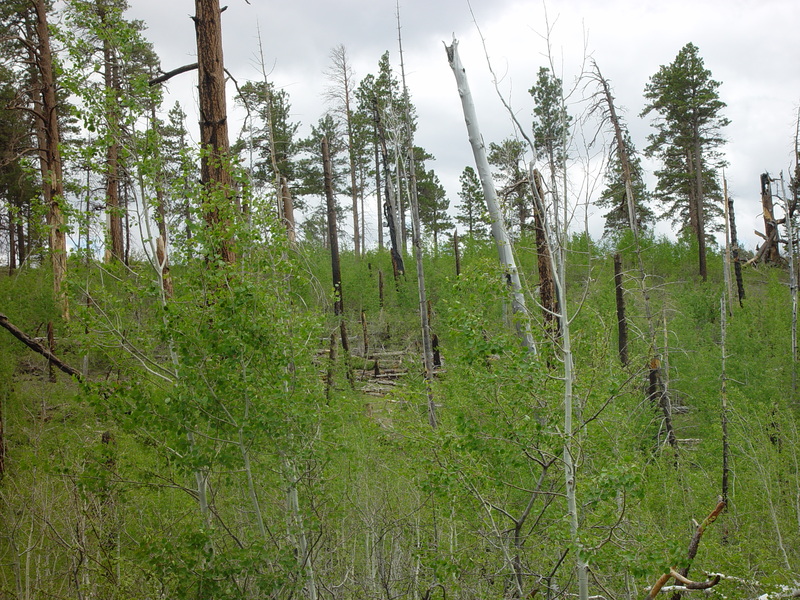 We drove past miles and miles of charred land, stumps and tree trunks, but then came upon areas where white-barked baby aspens were already thriving, able to get the sun and water they needed for the first time, without competing for it with the larger, more established pines. A new landscape was being created from the destruction. It reminded me of the metaphor of Shakti and Shiva that is often used to describe the rising of the kundalini life force during a spiritual awakening. Shakti, the creator, is coiled in the root chakra, waiting to be unleashed. As it rises up through the chakras, different doorways and energies are opened and released in our being, until Shakti joins Shiva, the destroyer, in the crown chakra, at the top of our head, representing union, and enlightenment. Apart from the theoretics of it though, what’s interesting to me is how specific places shift my own awareness, and how my body and psychic being intuitively respond to them. Some places are naturally healing and balancing, others are places of seeing, or doorways into other dimensions, still others are places of empowerment. 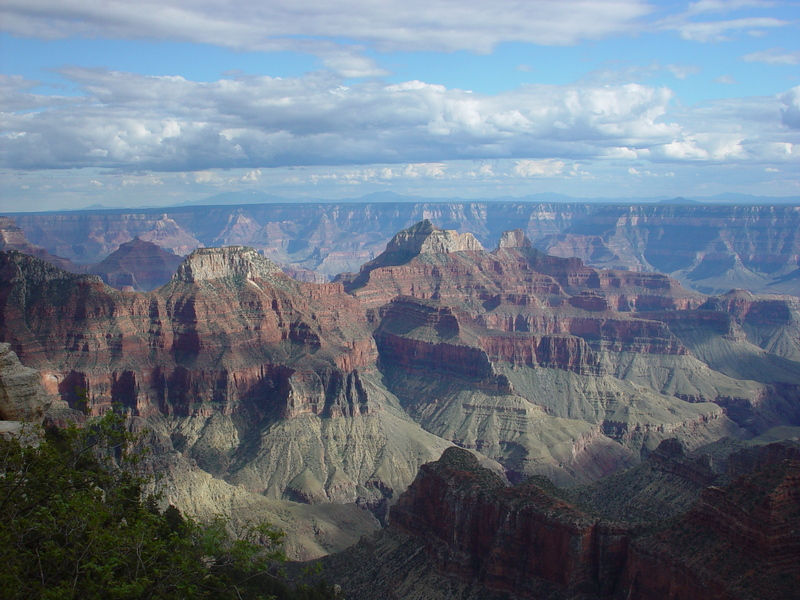 The Grand Canyon, energetically, is such a jolt of raw energy it stops you in your tracks. Then there is a burst of vigor, of pure life force, that seems to infuse almost everyone. I think it’s most interesting to watch young children in locations like this – they are like energy barometers, or canaries in a mine. Their own moods and states of awareness shift instantly in response to a place. They don’t have the kinds of walls or shields that we have as adults, which has its pros and cons. I have visited places that were stunning visually, but that instantly made my kids edgy or whiny. Other times we’ve been in seemingly unremarkable places, but they were infused with a lightness of being, a joy, an instant shift in mood. Alone I would notice these energetic shifts, but my kids often reflect them much earlier than I can tap into. Many power places are hard to stay in for too long though, and the Grand Canyon is one of them. After that blast of raw power, and the liberation and invigoration that follows, I think many people start to become afraid. In watching the tourists around me, and my own family and awareness, I saw this desire for familiar comforts start to creep back in. I have often experienced and witnessed this on desert retreats also. Places like this represent the void, our un-self, and at a certain point the ego becomes fearful, and starts to crave the structure and routine that give it meaning and a sense of control. I think the art of allowing a trip like this to transform from a tourist visit to an empowerment is working through that feeling, allowing ourselves to feel like a tiny spec, embracing our cosmic insignificance, for just awhile, at least. In that old earth’s chakras post I asked you to share your own favorite power places, and/or how they impact you. I’d like to hear of more, and from newer readers. Please share! what interesting thoughts. my favourite power place is the island where I grew up. I may have mentioned it to you before. it’s such an intensely energised place – formed from fire, shaped by shadow. it draws me constantly. even my daughter feels the energy. when we go there, our watches often fail, and we have more than once almost missed the boat home because time seems to slip and slide somehow. I don’t know what the chakra would be, but something to do with sensuality and mischief and shadow-love and old gnarled roots. Thank you for this, Lisa. I’ve always wanted to visit the Grand Canyon, but have never had the means to do so. I’ve heard that it’s truly magnificent, and that pictures just don’t do it justice, but your words here really brought that home for me. I’m definitely upping “See Grand Canyon” a notch or two on my bucket list. Nice piece, Lisa. I’d suggest Glastonbury is at least a nadi, if not a full-blown chakra. Could I propose another heart center in Europe – Montserrat in Catalunya, in north-west Spain? It’s a physically beautiful place (as any chakra-based site should be) with its rugged mountain hill ringed by fantastical, wind-sculpted rocks, many of them with names – the Parrot, the Mummy, Bernal the Horse, etc. To see it from a distance is like looking at a vast, painted backdrop, not a real mountain. It’s officially a shrine for a medieval statue of aMadonna, but I felt it had so much power, that putting it in just that box seemed limiting. My time there felt like a brief exit from planet earth. Sarah – now I want to visit even more! From your description sounds like a seers place? Your description made me think of both the 2nd chakra (creative, vortex, water) and 6th chakra (‘third eye’, insight, dreaming). I think of women as pulling in energy data from their surroundings via their lower bellies/2nd chakras, and processing it in the third eye/6th chakra. Not too literally, of course, but just as a way of talking. So from a chakra perspective that’s what this made me feel. 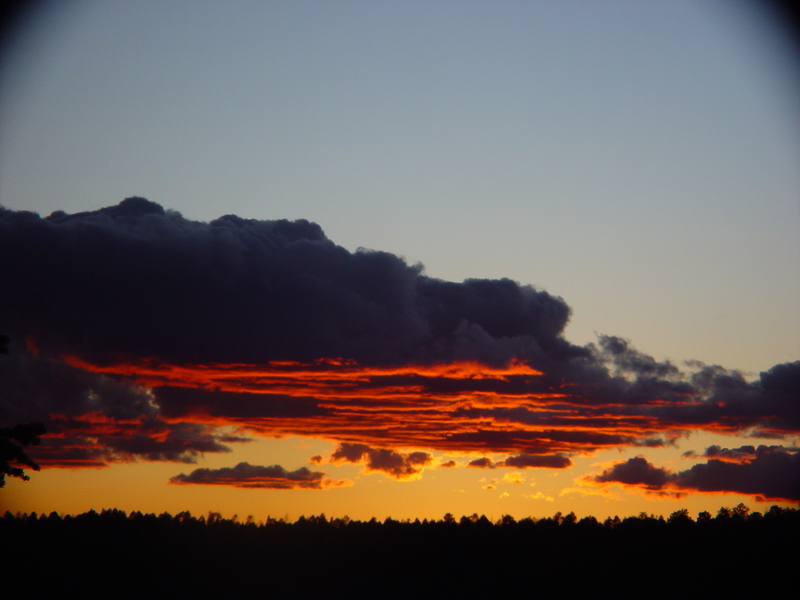 I live in Sedona, AZ and have the opportunity to take guests and visitors to the Grand Canyon several times a year. Every time I go, I’m struck anew by exactly what you posted and I’ve also noticed the reactions of children. One 6 year old sat motionless by the edge as her father took photos, and then abruptly said she had to leave. So powerful. I also agree with Edward about Glastonbury. It’s a very different kind of energy, but so real! So beautifully written that I had to read it twice to allow your reflections and insight to sink in. Probably return again later. I think being a spritual travel writer would suit you…and I might like to join you. I really love what you say about how places shift one’s awareness. When I visited the Orkney Islands off the northern coast of Scotland for the first time last May it shifted me in ways that I am still processing and learning. It is actually not my kind of place except for it being an island with dramatic cliffs and big sky and sea and an amazing stone circle. It has hardly any trees (which I can’t live without) and yet it pulls me and continues to change my awareness even after I have returned home. I think what you say about deserts and wide open spaces as places of the un-self, the void, somehow has something to do with why these kind of places speak to my soul. They surprisingly root me. Strangely, my mind wants to take me to the big tall trees and yet my soul longs for treeless islands. Also really appreciating this post as I am working on educating myself about the chakras. Another place I might suggest a visit is Cairo, Egypt. My spiritual life is based on nature and her cycles and yet somehow this big, overcrowded city calls something different out of me. Real and magical, the self and the un-self, just a tiny speck. Each line of rock, each change of color, represents millions of years, with some rock layers estimated to be 2 billion years old. The history of the world is written there. In that old earth’s chakras post I asked you to share your own favorite power places, and/or how they impact you. – I don’t go out that much, but I go in a lot and it is during these times when I experience what you said, “Places like this represent the void, our un-self, and at a certain point the ego becomes fearful, and starts to crave the structure and routine that give it meaning and a sense of control.” Weird things happen and it’s quite scary for me because I’m not familiar with the territory yet. Sunny – thanks so much for your input. That is so interesting, about what you’ve seen in children, and that 6 year old particularly. At least she knew when to leave, and didn’t just act out, which I’ve seen alot of adults do, lol. I’ve only been to the South Rim once – we have a house near Zion National Park, which is course closer to the North Rim. I think Zion and Sedona share many similarities, and they are about equidistant from the North and South rims respectively I think. They are like the ‘radiating out’ points, and much more heart-oriented, I feel, then the canyon itself. which is so raw. Nicki – yes, yes, I can relate very well to what you have said about being pulled to trees, and needing them to survive, on one level, and on another wanting to ‘take flight’ in a way, on the treeless islands. I do think we have this amazing healing relationship with trees. Of course we have a symbiosis on a physical level, with Co2 and Oxygen and I feel like it is true on the energetic level too. So deserts, voids, they are places to visit, to touch the un-self as a guidepost, but not to live. For most of us, anyway. Lisa, this may be another one of my favorite posts of yours. I agree with Jay, you could be a spiritual travel writer and, yes, there is such a thing. 🙂 Your affinity to the canyon lands is palpable and I think you are right on about the energy there – as well as the invitations they offer to us on a higher level. I adore the canyons, too, as you know and find them to be so powerful for stripping us down to the core of what matters. I fully understand why Native American tribes chose canyons and deserts for vision quests/initiation. You said it so well. There is “nothing” there but power, yet a sense of emptiness, so the self is surrendered to the Powers that Be; we bend to Its wisdom and lay ourselves bare. 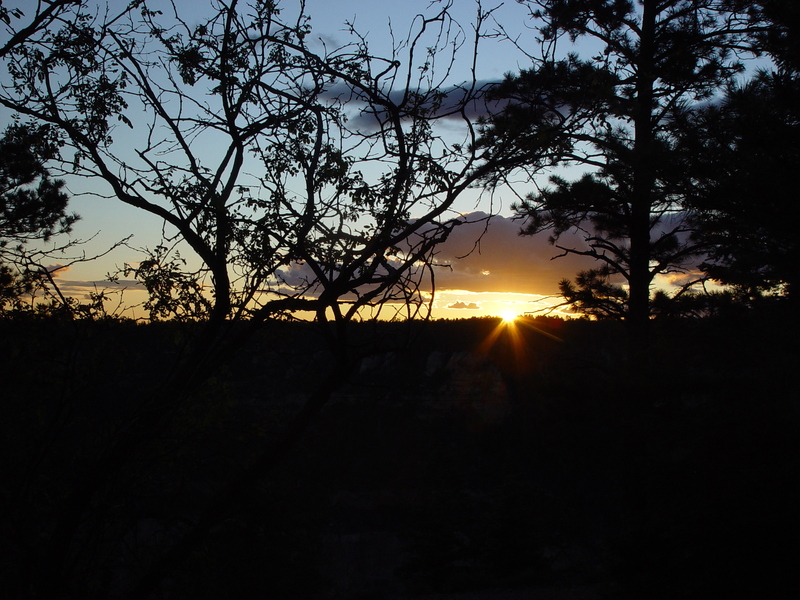 Humility IS one of the big lessons of the canyons, as well as wonder and awe. We stand in majesty. This is why I love to travel. There is so much in this world to see and “feel”. You captured the Grand Canyon perfectly. It is sooo grand that it becomes overwhelming – even to the point of walking to another point and feeling, Oh, another viewpoint, another view of the canyon. Almost becoming blase about it all. I would place the Grand Canyon among my favorite natural places to experience. My others would be Niagra Falls, for the sheer power of it all, Banff and Lake Louise for the purity, and Jasper National Park in Canada for the site of a glacier, blue-white water, and seeing the actual tree line, where growth stops. Although I consider myself a talker, these places leave me speechless and wanting to whisper in their presence. I always enjoy the Humboldt Redwoods with their massiveness, wind rustling through and sorrel, like a green carpet, on the ground. I feel as if I’m in a cathedral. Your canyon-like depth of understanding really shows in this illuminating post. And ‘jolting’ is the same word I would use to describe my first view of the Canyon. My eyes felt like an auto-zoom camera, where there is focus in increments because instant focus is impossible at such distance. It took the longest time to actually see the bottom. It’s funny though. Standing on the rim of the Canyon, I didn’t experience any queasiness in my stomach, yet when I visited northern California, it was just the opposite. My son took me north along the great mountain ledges that drop precariously straight down to the ocean. On the drive back, looking out over those ledges, I had an overwhelming physical sensation in my belly that was almost debilitating. People who live there and make that drive every day are constitutionally very different from me. I know what you mean about the power of the canyon and Kingsolver’s quote is perfect. I think one place in the world that taps my sense of wonder is Tuscany. The way the light hits the cyprus trees and olive groves is magical. Gramma7 – More places for my list! I have been to Sequioa National Forest a couple of times in the last few years and the redwoods there left me spellbound. Really such an amazing place, and amazing trees. Brenda – Mamashamanism, I love it. Maybe it’s time to move from ‘mommy mystic’ to ‘mama shaman’. It’s so interesting – you are literally the third person in the last couple of weeks to use the word ‘shaman’ in relation to me. It has kind of caught me off-guard, somehow I didn’t think of myself that way. But I do see how I have been moving in that direction, almost in spite of myself. Thank you for noticing it. Cate – I have not been to Tuscany! Yes, the light in the pictures and movies I have seen is just so amazing there. It’s all in the light of a place, I think, you can tell so much by that. Wonderfully written Lisa…all places do have unique energy to share if we attune ourselves to it. I loved what you said about shakti and shiva…destruction and creation…not only does nature do this but we do it again and again in our own lives as we continually recreate and transform ourselves. Oh Lisa, I do agree with Jan, there are spiritual travel writers and you can consider it, why not? I never thought of power places, I obviously do not know a lot about these things. However it is great to have people like you point that out. I love being in nature, and I remember always getting extremely annoyed when people made noise there with radios on campings where there was supposedly no electricity. I love the stillness and yet the sound of the trees. The sea is also a wonderful place for me, I love being in the kayak, to be sliding without noise on the water, close to rocks and coast lines, sheer beauty. Beautiful post, Lisa. I’m amazed daily by what Mother Earth has provided for us in her playground. I’ll have to go back to the Grand Canyon. I haven’t been since I was a kid. That raw energy is quite stunning. I’ve been thinking about other places I’ve been and there’s only one that draws me in repeatedly and that’s the coast of Monterey (17-mile drive) in California. I told my husband to take me there if I ever get really depressed because my soul is awakened and renewed by the architecturally inspiring Cypress trees, the ragged rocks, and the unruly nature of the ocean. These all work together to draw me into the raw energy of Mother Nature. I could sit for hours and just watch the light move among the trees and listen the waves. Just thinking about it, I want to get up and go. It’s been too long. I’d like to see Glastonbury and the south of France as well. I hear there is big energy there. Thanks for the post. It’s good to get me excited about traveling for the summertime. Laura – yes, exactly, re: the shiva and shakti in our lives. I think that’s the power of that metaphor, in a micro or macro level. The interrelationship of desctruction and creation, that there can’t be anything new unless some old structure is shed. Wilma – You seem so naturally in touch with nature, when you write about it, and how you have chosen to live. I have not done alot of kayaking but it is something I would love to try, for exactly the reason you mentioned – being able to be so quiet as your paddle through an area. To blend in. And yes, it never made any sense to me to go camping and blare your radio or TV. Why bring your regular world with you? The idea is to get away from that! Melinda – yes, Monterey, I should get back up there. Aren’t you in San Diego now? I feel like La Jolla, the Torrey pines area, and the cypress trees there (they are cypress also right? ), are so amazing also, energy-wise. I would actually like to get down there also this summer. it’s astounding Lisa.. I have no comparison – I can only imagine something not of this world. Not even Uluru which is akin to this (perhaps?). How do we imagine the power of presence that goes beyond the antidiluvian? It’s beyond-ness. 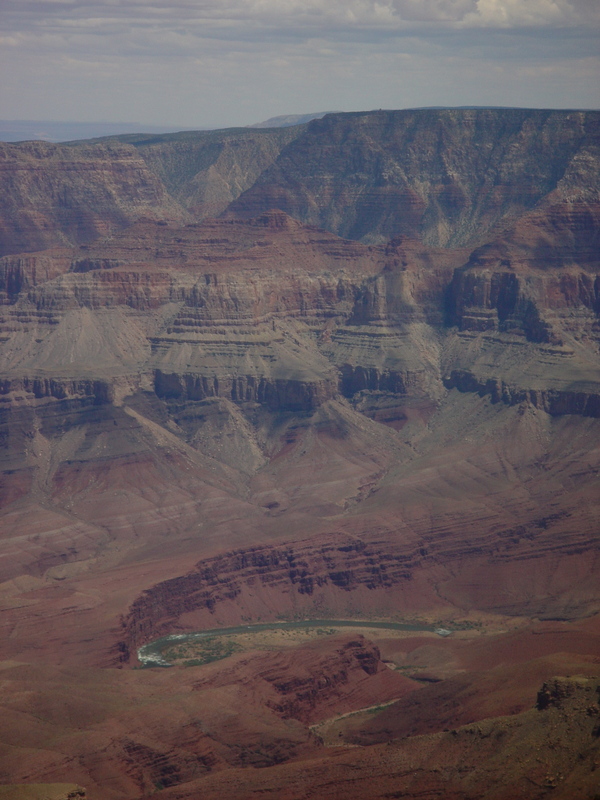 I’ve only ever flown over the Grand Canyon, and even from that height and distance I was stunned and quieted. It was indeed humbling, mesmerising. With such a mythic power – shiva and shakti – such an appropriate story/analogy. And I can see absolutely what you are getting at when you write of the ‘void’, the ‘unself’. It’s so lovely to get back to your writing! I’ve been on a blog hiatus in terms of reading. Major life shifts happening down here for me – all ultimately good. I so hear you about the energy of places! 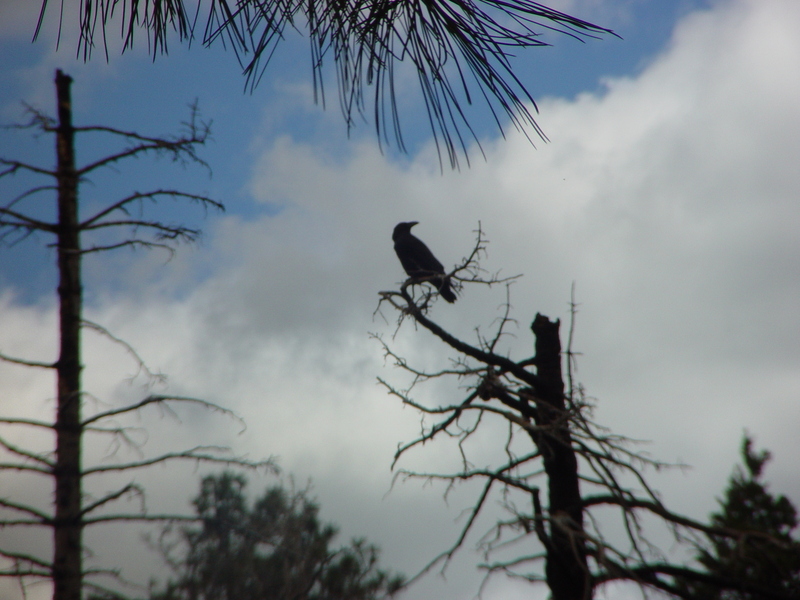 I was in Idyllwild, CA a couple of months ago, and felt a presence and fullness I’ve never experienced before. It was like I needed nothing at all and was in a place of complete awareness and service. So lovely! I’ve also been to Sedona, and actually felt slightly nauseous in certain places. It definitely shook loose some energy, but it was a distinctly different energy than in Idyllwild – more unsettling. Thanks for sharing the beautiful photos and thoughts! Oh – and I love Brenda’s term “mamashamanism!” So perfect for you! This will reveal how long it’s been since I’ve visited, but I love the new look of your blog. The header is fantastic! Love the colors, the fonts, the Egyptian eye, everything! Cool!! What a beautifully written post! I felt so grateful while reading this, grateful that we have such beautiful, powerful places to visit on this earth, and that the energy emanating from all of them is so different yet equally compelling. Any new city I visit, I feel a different energy, and sometimes it takes me a long time to grow comfortable with it. I feel different with natural landscapes, as I don’t feel such a resistance for some reason. Perhaps this is something for me to investigate. I haven’t been to Grand Canyon since I was a small child, but I vaguely remember the awe I felt while I was there. I do remember feeling small, but it was not something that particularly bothered me then. I really appreciate the way you write about chakras here, as I have no knowledge really of them. I do have a book on my shelf though, about chakras, that I’ve been meaning to read. “A new landscape was being created from the destruction.” This resonates with me. I see everything as potentially arising from chaos, from a darker place (the word darker being a highly interpretive word here) in search of light. How true for nature, for people, for animals, for anything that lives and reincarnates. As for a power place, I am afraid that I do not really know. I return to, time and time again, to Campos, a small farming village some hours outside of Rio in Brasil. My grandma and I would go there and stay with her relatives. The house had no electricity, no running water. Corn fields. Dilapidated homes. Dirt roads. But I knew such happiness there. I suppose I associate it with humility (which you wrote of), imagination, childhood, earth, and love. 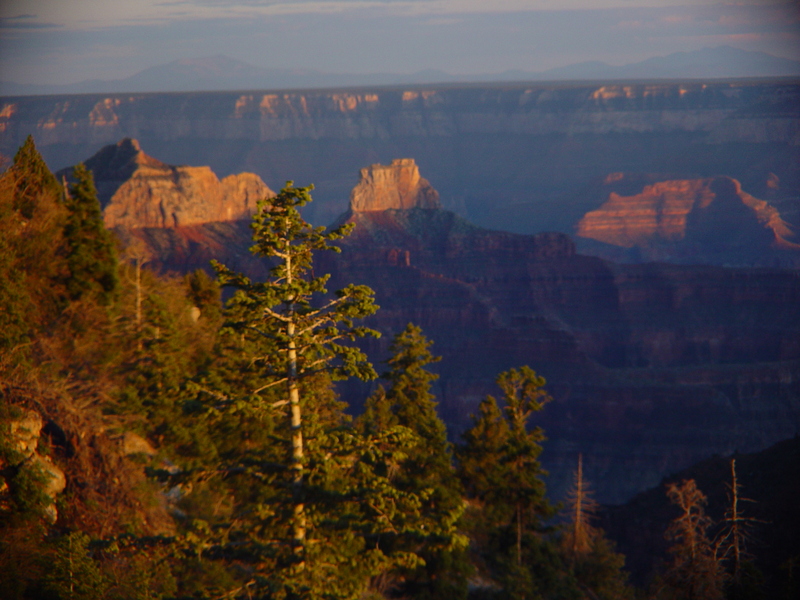 Years ago, my husband – then boyfriend – invited me to see the Grand Canyon. He was located in the air base in Arizona at that point in time. Well, I didn’t. We were at the beginnings of our long distance relationship. The chance slipped by. Subsequently, he had to move to Montgomery, Alabama. And soon, the work stint in the States was over. Looking at your pictures and reading your account made me wish that I have chosen differently. Then again, I would not have felt ready back then…to understand the power and to enjoy the mystique of such a beautiful place. Oh well….never say never….who knows?…someday a chance may just come by again! Alexis – I have visited both Idylwild and Sedona only briefly, so I didn’t get a real feel for them. I think of Sedona as kind of being the counterpoint to Zion (where we go) on the south side of the Grand Canyon (Zion is about the same distance to the north of it). But Sedona has more access and development, I think. I think both are fluid places – which to me means they can swing between dicey and pure energy. So I wonder if you entered into a dicey area of some sort and that’s what caused your reaction? Of course there’s so many other factors at work – the people around, the food, processing going on, etc. – who knows? Juliana – thanks for stopping by! I have never been to Brazil, Campos sounds like it must have a real magic to it, in addition to the wonderful energy that it sounds like your grandma’s family must have created in their own space there. I agree on creation/destruction, although sometimes it’s hard to see, especially when the destruction is man-made. I think I am connecting with this theme right now because of that – trying to see how nature can recover from some of the things we have done, and how we can aid it. Not always sure it’s possible of course! Which just means something else will be created instead, which we may or may not like. Evelyn – I had something similar happen with Stonehenge, years ago when I was in college and spent a year in Oxford. There was a group trip to Stonehenge which I passed on, and now I go ‘what was I thinking?’ But like you, I think at the time it wouldn’t have meant what it would now to me, so perhaps another time…if you ever DO come visit the Grand Canyon, let me know so we can connect!!! I read this yesterday and it stuck with me all night. The vastness of this land scape is incredible to imagine. I would love to visit there as open landscapes are what I love best, but liek you mentioned, maybe it would almost be too much at the grand Canyon – yin and yang again – such openness maybe verging on overwhelming and creating a need to retreat into the controlled creature comfort environments. Children are completely free in and with this type of energy too wherever they go, I so agree! They’re like wee kites on the ground – mine are anyway – in places where the energy is especially concentrated or big. So I love it when I go to the East coast – all the trees have been removed by man of course, but I love the vista and openness it provides. Sometimes I get too claustraphobic living near the wild and where the mountains meet the sea. Hey, really glad to hear you have bees in your back yard!! 🙂 We don’t anymore 😦 I hope they come back this summer. Thank you for this amazing insightful post and for sharing it. p.s, yo would find nz incredible. so much different terrain on 2 a relatively small islands. tehere is a fault line running through the middle so it has created some pretty extreme and incredibly energetic environments – active/dormant volcanoes too. I have met a couple of mystics not from NZ and on my travels abroad who have enjoyed the powerful energies around NZ. Around Auckland and the Hauraki Gulf and Rangitoto Island is one and another being down here where some of LOTR was filmed – the big boulder areas on the foothills. The ‘pancake rocks’ is a pretty zingy environment – there are piles of rocks that literally looks like big tall stacks of pancakes right on the coast. Were you at the Grand Canyon on July 6,2010? We were there at sunset. A couple of photographers were there that evening. One of them took pictures of my daughter and her service dog on the Kaibab tour bus. I have tried everything to find him. If you have any info, please email me at sjfaulk@aol.com. I am on my way to Grand Canyon and your article is exactly what I wanted to know and connect to. Each word resonates so much with my spirit being. Angeli, have a wonderful trip! I don’t think much about chakras or anything, but I did a Google search to see if there was a Native American reference to a spirit that pulls someone into the Grand Canyon. I have a hard time understanding why I am in love with place. It feels like madness to me. I couldn’t really find anything about that, but I found this post, and it is fantastic! You did a great job at getting a grasp on the ineffable qualities on this magical place. Thank you for the read.